MC542 Nema23 digital driver - 2 Phase digital stepper driver - Shenzhen Xinli Chuan Electric Co., Ltd.
MC542 is based on DSP control of a new generation of digital two-phase hybrid stepper motor driver can be customized according to user needs within 512 subdivision and rated current within any current value, due to the internal increase in the automatic identification of motor parameters, Can be used for different motors with the corresponding operating parameters, the motor running very smooth, very little noise. 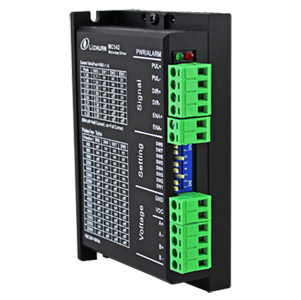 SW4 can be used to set the automatic semi-flow function of the drive. OFF mean the quiescent current is set to half of the dynamic current, and ON means the quiescent current is the same as the dynamic current SW4 should be set to OFF for general use, resulting in reduced heat generation in the motor an the drive, resulting in improved reliability. Approximately 0.3 seconds after the pulse train is stopped, the current automatically reduced by 50% (55% of the actual value) and the calorific value is oretically reduced by 65%. horizontal can be horizontal or vertical mounting （suggest the vertical installation) when installed ,mke it close to the metal cabinet to facllitate heat .